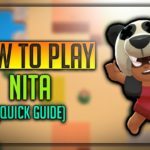 Bull Brawl Star Complete Guide, Tips, Wiki & Strategies Latest! 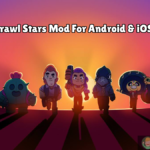 Home » Bull Brawl Star Complete Guide, Tips, Wiki & Strategies Latest! 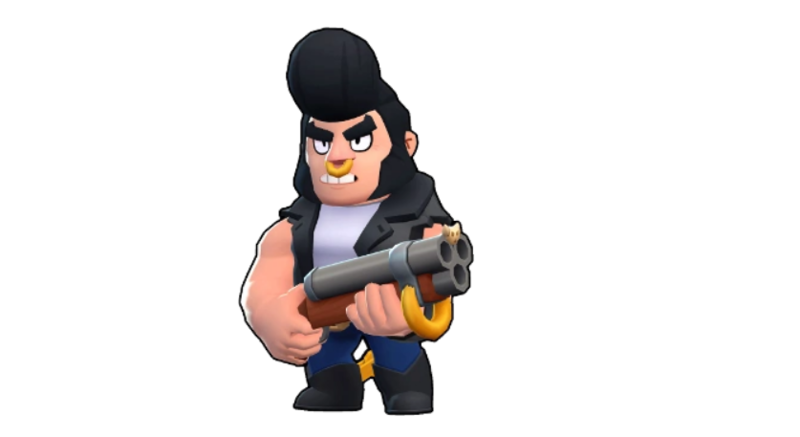 Bull – The name could be inspired from Real Bull, As animal bull tries to attack with his horns fastly, Similarly, In Brawl Stars, This Guy Bull with a Shotgun has a special ability which damages everything, Smash obstacles in his way. Bull is a powerful Brawler unlocked when you have 250 trophies, He holds a Shotgun and blow off enemies. 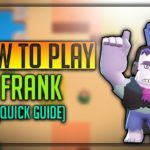 Let’s discuss Bull’s Stats, Strategies, Tips, Tricks, Strength, Weakness and much more! Read till the end to get maximum out this article. Bull is a Gigantic guy wearing a Biker Jacker and having a Shotgun in his hand. You can unlock Bull. When you have 250 Trophies! This character might resemble Shelly, But he has more HP than her, He excels in mid-range combat. With high HP equal or more than EL Primo, He can easily Ambush and destroy the enemy. With his special, He can destroy any obstacles, Enemy on his way. Bull has a shotgun which shoots in a wide range like Shelly’s, Bull has lesser range than Shelly, More damage than her. The Bullets or Shells go till medium range. 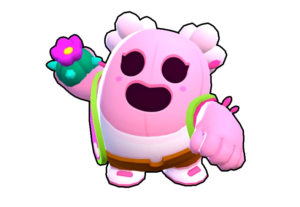 Similar to Shelly’s attack, Her attack is very good at close combat, Bull’s attack also very good at close combat, As more shells, Pass over the enemy. So His good combat and high Health combination, Bull could be a deadly combination and nightmare to enemies when properly used up. Bull’s Superpower name is Bull Dozer. He runs very fast for a particular range, Damaging any objects or enemy Brawlers on his way. It is very useful to capture running opponents and damage them. It’s very useful in many cases. Bull’s star power is unlocked at level 9, When he falls below 40% of his health his reload speed doubles and makes him deadly. High HP is one of the greatest Strength of Bull. His Super is very good at helping the critical situation, Such as when enemy gathered 10 gems and running, Bull could use his ability to capture him. He is a very good survivor in showdown because of his high health. He can also be used as a tank, One of the great Gem Holders in Gem Grab next to El Primo. In Heist, He could easily break and go near the Heist and do some decent damage. Bull could be easily victimized by long-range brawlers. In Showdown, His Super could end you in the poison cloud, So be careful when using. His super should be used properly else enemies will gather together and kill him easily. Not a good crowd controller. 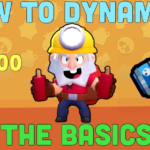 Using Bull is very Simple, use left analog to control the direction of his, Use right analog, Tap to instant fire shots, Swipe and attack to aim and shoot , His special could be launched by taping special button or swiping and holding on a particular direction. Here are some of few tips to use Bull. As Bull could do awesome damage in close combat, If multiple enemies are near you, He is very useful in inflicting area damage to all of them. Bull could battle El Primo Easily with his close combat gun. Make sure to use bushes to hide and give surprise to the enemy, With his high HP and close combat, Bull is deadly. Always keep an eye on Bull’s health, Bull needs to be near to the targets to attack properly. 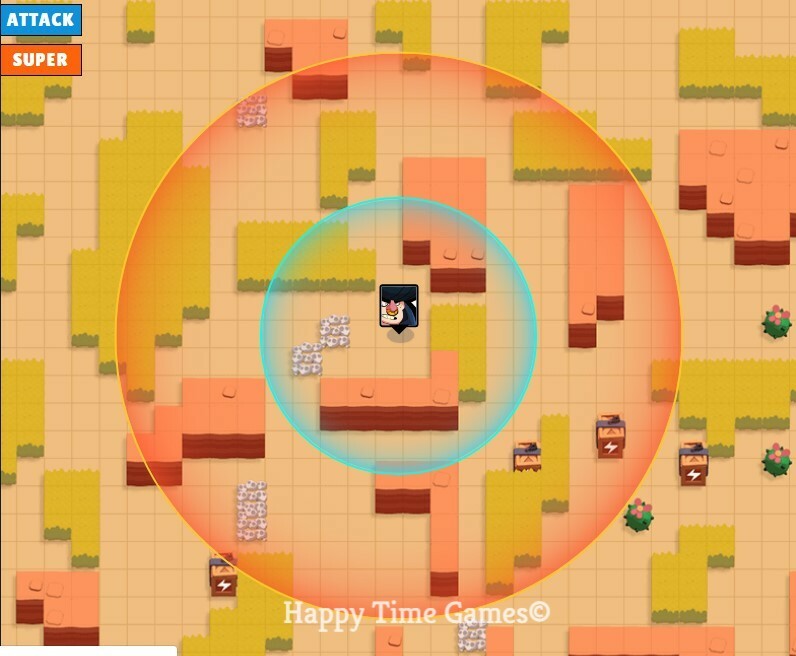 Bull’s Super could take him near to long ranged Brawlers who were disturbing him continuously, With few shots, they will die for sure. Again his super could be used to run away when he has weak HP or holding any crystals, Or if enemy surrounded him, he can do this. 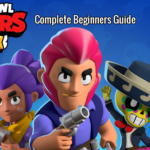 Bull is good against El primo, Long range brawlers, Mortis. He is Good in Gem Grab, Heist. Bull is very useful in the following strategies. Use bull’s high HP to gather Gems, He could tank a good amount of damage, And after getting 10 gems, Bull could retreat back to his base, Safe position with his Super. Bull’s special ability could be used to destroy wall’s and obstacles, Which could be very handy on Heist, Could reach near safe and can deal a decent amount of damage. 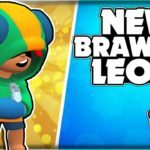 Bull is extremely powerful in showdown because of his high hp and extremely powerful in close combat, I gained a lot of trophies using Bull, One tip is that use bull’s super to escape or get near to/from enemy brawlers and make sure that you don’t land in any poisonous cloud. 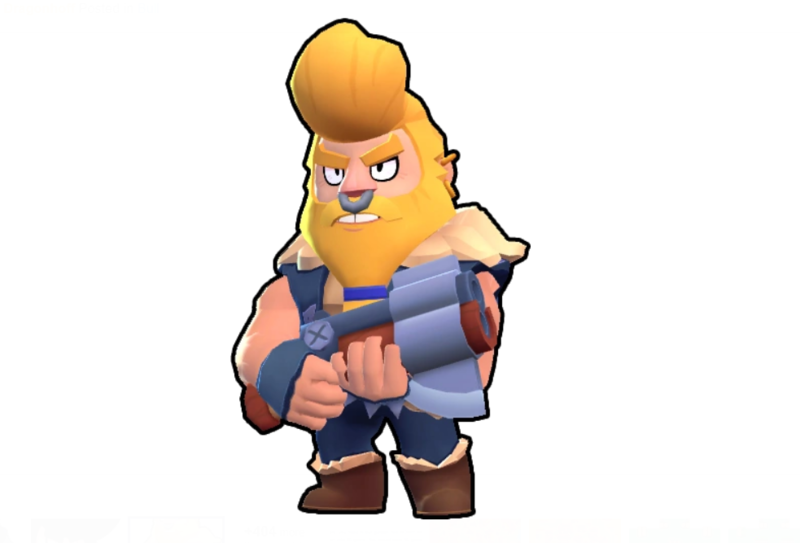 Bull is unlocked when you have 250 trophies, You need 80 gems to unlock Viking Skin of him. 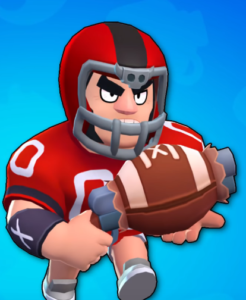 Football bull will be released soon as a celebration of Brawl Stars Lunar new year, How much gems do you expect that skin will cost? 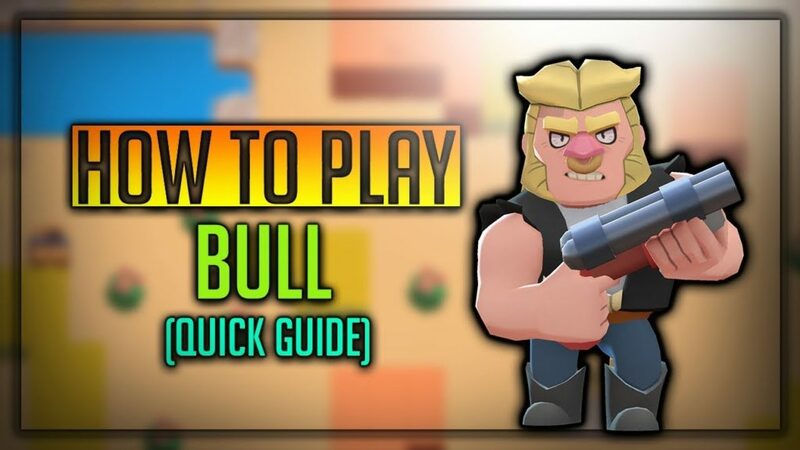 We hope you have liked the complete guide about “Bull”, Bull is a powerful guy, He can handle any kind of dangerous situations easily, Make sure you practise a lot with bots, Before playing vs players.